The Minnesota Golden Gophers made the 2013 NCAA tournament as an 11-seed thanks in large part to their (perceived) strength of schedule. Today LNH attempts to give readers a feel for the difference in the 2013-14 schedule compared to last year and what it might mean for this year’s team. The RPI is a flawed and overly simplistic ranking system in terms of its output. However, the actual calculations involved are more complex than most people realize. 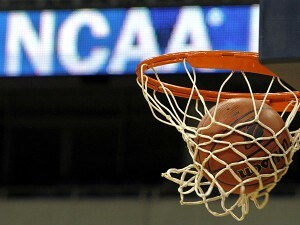 Although we don’t care for the RPI as a tool to measure a team’s past success or to predict their future, we recognize it’s a ranking system which does get looked at by the tournament selection committee. On New Year’s Eve when they face Michigan State, Minnesota will have gone the first 30 days of December without playing a game during which their win probability dropped below 77%. The Golden Gophers have been rolling over competition, but in the 19 days from December 12 through December 30 the team plays just one game. During the slow stretch, the only competition the nationally ranked Gophers have is a home date with Lafayette (a school in Pennsylvania not to be confused with the stronger Louisiana-Lafayette basketball program). As we wrote a few weeks ago, the projected RPI for Minnesota looks excellent thanks in large part to playing few teams that are anywhere near as bad as Lafayette. In fact, even with a 9-9 Big Ten record Minnesota’s RPI could be in the 20-25 range (or better) and we would project them being comfortably in the NCAA tournament just by winning half of their conference games. However, the nonconference schedule is not without some negatives. First, the Gophers have not welcomed any teams of great interest to Williams Arena. This has meant less television exposure for the folks wanting to watch at home, grumbling from those at the Barn and may be partly responsible for another drop in attendance. As for the large break in scheduling, there are pros and cons but overall Minnesota’s schedule is not set up how most teams would prefer. The team is transitioning from 12 games (excluding exhibitions) in just over one month to a single game over the course of nearly three weeks. True, the schedule gives injuries time to heal and in the case of Austin Hollins that may be significant. On the other hand, Wally Ellenson has just 4 minutes of career playing time, Mo Walker has been used sparingly and Trevor Mbakwe has not played as much as he’ll need if the Gophers are going to have a great season. While many teams have some pieces that need fine tuning before the start of the Big Ten season, Minnesota has some potentially key parts that haven’t been tested much. Unfortunately, the main shop – i.e., real game competition – is closed. This is the longest stretch of playing just one game in Tubby’s tenure at the U and is also an outlier when compared to other Big Ten teams as they gear up for conference clashes. Every other team plays at least 3 games between mid-December and their first conference game. Realistically, the negatives can be mitigated by a good practice plan and we’re not too worried about time away from competition. However, it’s far from ideal and it’s not the norm. A summary of teams’ schedules leading up to the start of Big Ten competition is below. Key: “Opener” = date of conference opener; “Days off b4” = off days between last nonconference game and conference opener; “Days off b4 -2” = off days between second to last nonconference game and last nonconference game; “Dec 15, on” = nonconference games from December 15 until conference opener. 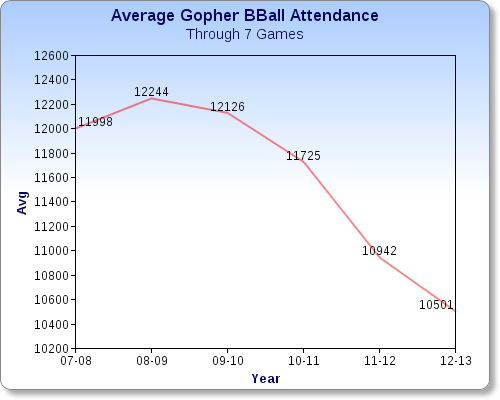 Late Night Hoops looked at attendance for the first seven games of each season since Tubby Smith has been at Minnesota. Thus far in 2012-13, attendance is down by 4.0%. As illustrated below, attendance has declined for a fourth consecutive year. With only 7 games being analyzed, we also considered whether there were certain “big games” that drew fans to campus and contributed to the trend seen above. We did not find that to be the case. 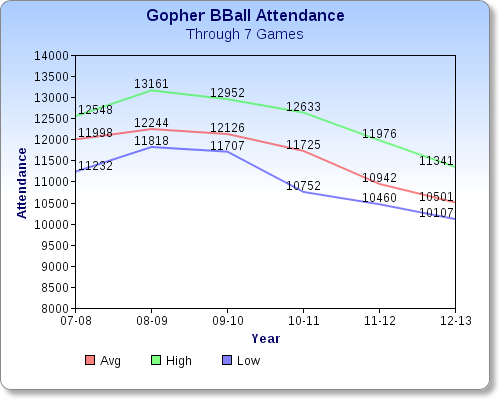 The chart below illustrates not only average attendance, but also the high and low game each season. According to numbers published this week by the Star Tribune, non-student season ticket sales are down more than 1,200 this year. However, we believe that a number of former season ticket holders are still attending some games, opting to make single game purchases instead of paying a preferred seat fee. Despite the 4.0% decline in attendance so far this year, there are reasons to be optimistic. Based on last year’s weak comparable, the strength of the current year’s team and promotional activity by the school, we believe the ‘U’ can top last year’s Big Ten attendance numbers. The revenue numbers may not be aligned exactly with attendance due to the cost of promotions, but an improvement in attendance would be a welcomed change for the team and fans alike.